There would seem to have been no specific camel corps in the Ottoman Army during the war of 1914-18, but they did raise units of camel-borne infantry at various times for particular campaigns. The first of these was for the advance on the Suez Canal in 1915, and later on camel units were raised and sent into service in both Syria and Iraq, while similar troops operated in the Hejaz and Yemen. Most of these units were made up of Arabs, since they were already familiar with riding the beasts, and many were irregulars, raised for the duration of an operation. Although originally seen as good troops, they increasingly became viewed with suspicion as the Arab Revolt developed and their loyalty came into question. There is not a great deal of information on the appearance of the various Ottoman camel troops, but what there is, plus a few photographs, doesn’t match what we find in this set. Strelets have delivered a set of men dressed in standard Ottoman infantry uniform but riding camels. Four of the poses wear the traditional Arab shemagh, but the rest wear the standard kabalak helmet, which would offer virtually no protection from the sun, wind or sandstorms at a time when the soldier was particularly exposed and unable to find any shade. All photos show every man wearing the much more practical shemagh, so we are inclined to suggest these figures are not appropriate for camel infantry, although of course it is certainly possible that individual soldiers might get a ride on a camel if the opportunity presented itself. One other possibility is a zouave-style uniform apparently worn by one unit, but again these figures do not match that description at all. For men on patrol or advancing most of the poses here are suitable. There are nine that are mounted, and while everyone has his rifle in hand for some reason (normally they would be holstered on the saddle), we find men in relaxed mood, looking to left or right, or taking a drink. 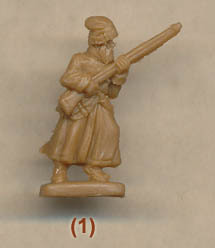 One imaginative pose is even wiping his brow, although the way he holds his rifle is a bit clumsy. One man seems to be firing from the saddle, which would be pretty unusual and not something to be recommended most of the time. The three foot poses are OK, although the middle man is awkwardly positioned and the man pulling on a rein has no animal to match with. The camels in this set are the same as those used in various other Strelets sets, and have been discussed at some length in our review of their British Camel Corps. In essence we felt the general appearance of the animals was good, but the gaits were not. The first two pictured animals are clearly walking, yet the arrangement of legs is very unnatural and so poorly done. The second pair of animals have all hooves on the ground, so are standing still, yet the legs seem to be arranged as if they too are walking. This makes for a very odd-looking creature which again is not natural. Only the last pair met with our approval, which is not great when only two of the nine available mounts are properly done. The sculpting is a bit varied, with quite good detail in places but none at all in others, so for example none of the rifles have any sort of detail at all. Proportions are OK and these are not the chunky creations of old, but there is some flash and a slightly rough finish round the seams. Eight of the mounted poses can be persuaded, with some difficulty, to attach to their camels correctly, but one is impossible. Looking at our images it is easy to tell which one - the first man in the second row, who has legs so close together he would not be able to accommodate a horse between them let alone a camel. In fact he looks like he was originally meant to be standing, and then someone took the base away and added pegs as an afterthought. The pegs don’t work too well anyway since they are quite crude, but gluing will fix that. We would have liked to have seen more kit attached to the camels, something like the box artwork shows. In fact all we get are a couple of bags that attach to the rear of the saddle on two of the animals. As with the other camel sets from Strelets, we wondered why everyone is holding his rifle, when they would have dismounted to go into action, although otherwise the poses are reasonable. The sculpting is not so great, especially with the man who cannot be attached to his camel, and the animals themselves are not well thought out either. Add to that the fact that each man has stirrups, which were never part of the equipment for a camel rider. However our main concern was the validity of these standard Ottoman uniforms, when what little written and photographic evidence there is suggests the men wore more or less their normal Arab clothing, often with bandoliers around the trunk, and only the officers, who would be Turkish, wore standard uniform. As always it is hard to condemn for lack of evidence, but we are far from sure that this set has much value at all.